Hello listeners! As you no doubt know, I never need much of an excuse to shout-out about anything and anyone in Swindon. Nor to give older posts a refresh. So here’s not one but several reasons to mention David Bent again. David lives and works from his studio in Swindon’s Old Town and plays an active part in the local community and supports the creative hotspot that is Swindon and indeed its wider area. David is widely known and internationally renowned for his aviation paintings and his association with ‘The Reds’ – aka The Red Arrows. Having been invited to collaborate with the team David maintains a very positive relationship with these most magnificent men in their flying machines. 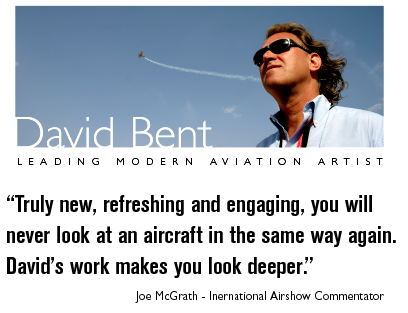 ‘Leading modern aviation artist David Bent was first invited to collaborate as Artist in Residence with the Red Arrows in 2007. This remains a positive and enduring goodwill relationship. Some of David’s aviation art will be on display locally when Swindon Remembers The Few in the forthcoming Battle of Britain commemorations which will be centred around Harold Starr. There is though more to his work than aviation, notably his ‘Movement‘ works – more of which you can find in the round-up below of David’s recent and forthcoming activities – one of which is the forthcoming Open Studios. I intend to be there! 2016 : Artwork created during the 2014 + 2015 residencies will be included in a wider exhibition of his work at the Russell Cotes. ” We are delighted to be able to host artist David Bent again this year as our official artist in residence during the Air Festival and are excited to also involve the talented students from the Arts University, Bournemouth. Having been a patient at the GWH in the summer of 2014, David has returned in happier circumstances in 2015 with an exhibition of his work. As part of the event ( May – October ) he is giving a tour and a talk about the work to members of the hospital team and arts committee in September. OPEN STUDIOS – OVER A DECADE! David has taken part in Swindon’s Open studios event for over a decade in support of the event, for artists in Swindon and the surrounding area. One year early in the 2000’s taking part with two other artists who live in the surrounding area ( Vanetta Joffe & Paul Ricketts ) just to keep the event alive. Six artworks from David’s Battle of Britain series will be displayed at Radnor Street Chapel 12 – 15th September in support of the Commemorations. These were first exhibited at St Paul’s Cathedral in 2010 , marking the 70th Anniversary of the Battle of Britain. David is giving six primary schools each a copy of his ” Celebration of the Red Arrows ” book . As a social expressionist whose work extends beyond aviation Art , David has created a wide collection of work – including Movement 2000. This installation of eight paintings reference the movement of people around the world who through war, famine , poverty – seek a better life. This work was created leading up to 2000, influenced by the Balkan Wars – it is even more relevant today. David is keen to find a good home to exhibit this work effectively. This biography of Harold Star, and everything on this page, is reproduced with the kind permission of Swindon Heritage. Harold Starr is the pivot around which Swindon will remember The Few. Here’s just part of his story. Harold Starr was born on September 8,1914. He was the fifth of six children born to Ellen and Morley Starr. He grew up in the Central Temperance Hotel in Regent Street (now the site of the Savoy – there are blue plaques there commemorating the Starr Brothers) where his mother was proprietor and his father worked as as shop fitter. Harold attended Clarence Street School but completed his education at Cotham Grammar School when the family moved to Bristol. While still at school, Harold became a member of the Officers’ Training Corps, and, at the age of just nineteen he won an RAF scholarship. He was awarded his ‘Wings’ in 1935. However, following an accident at South Marston in June 1936 ,it looked as if Harold’s flying career might be over. While practising a forced landing crashed and the wing of his Hawker Audax damaged the gable end of Hunt’s Copse farmhouse. Harold received life-threatening injuries sustaining a fracture at the base of his skull and leg and chest injuries. He was out of action for more than a year. Within two months of the outbreak of war, Harold was back flying and,on August 8 1040 he was placed in command of 253 Squadron. The Battle of Britain campaign diary records that August 31, 1040 dawned fair but hazy as formations of enemy aircraft appeared in the Deal, Dover and Thames Estuary areas. At 7.55 am, around 250 aircraft attacked in five distinct waves. The onslaught continued until the evening. RAF Biggin Hill was bombed twice causing a serious fire and wrecking aerodrome buildings, runways, gas and water mains – as well as aircraft. By the end of the day, Fighter Command reported its heaviest losses to date. And among those pilots was 25 year old Squadron leader Harold Starr. Harold’s Hurricane was short down over Estry near Sandwich during an interception patrol. After his plane was hit the young pilot managed to somehow bail out at 15,00 feet. But, as he floated down on his parachute, three Messerschmitts circled him and opened fire with machine guns. His body came back to Swindon for burial in a family grave in Radnor Street Cemetery. His funeral took place on September 6, two days before what would have been his 26th birthday. So, come September this year, when the country will remember all of the The Few, Swindon will honour Harold Starr in its own special way. Born: 8th September 1914. Died: 31st August 1940. Killed by enemy fire after bailing out of his stricken aircraft only a few days before his 26th birthday: one of The Few. From the press notes: Squadron Leader Harold Starr was born in Swindon in 1914. He became leader of 253 Squadron but was killed at the Battle of Britain’s height. His plane was hit at 15,000 feet in the skies over Kent. He bailed out only to be machine gunned to death as he descended in his parachute as three Bf 109s came back for him. 2015 marks the 75th anniversary of the Battle of Britain and Swindon, as with cities, towns and villages up and down the country is marking the occasion. But the town is doing so in rather a lovely and moving manner. Rather than marking the anniversary as a general thing it is doing so by paying special attention to one man among many. Or more to the point, one man among so few: Squadron Leader Harold Starr. Today I went to the splendid STEAM museum to the Daniel Gooch theatre where I attended the press launch for Swindon’s activities in commemoration of and, yes, celebration – of the Battle of Britain. Commemoration of the loss all the Harold Starr’s of this world but I think, celebration too. Celebration that they were selfless enough to do what they had to do. And celebration that, because they did so, we in the west can have the lives that we have. The press event commenced with a presentation that was quite moving. It showed archive images from WW2 to a background of music we know so well: The Dambusters and 633 Squadron and Churchill’s famous speeches and of course that awful and awesome air raid siren. But never mind all that I hear you cry. What can Swindonians look forward to in celebration of this momentous anniversary? Well, quite, rather a lot is my answer to that! The town is going to witness a spectacular flypast by the Spitfires and Hurricanes of the Battle of Britain Memorial Flight – the BBMF – on September 15th – the actual Battle of Britain day. It will form a unique formation to honour the 544 pilots of RAF Fighter Command who were killed in the battle. One of whom was Harold Starr. The BBMF will fly directly over Harold’s grave in Radnor Street cemetery. This will be a fabulously, fitting tribute that will mark the culmination of a week of events being called ‘Swindon Remembers’. Speaking of Graham Carter – here he is sounding a WW2 siren. It may or may not be the genuine article but it’s nice to think it is eh? He’d look good in an ARP hat don’t you think? First Great Western, the main sponsor of the week’s events will name a Class 43 locomotive in honour of Harold Starr. So nice to know their exorbitant fares are doing something worthwhile. One of their high speed trains will be named in honour of Harold. And, cynicism about FGW aside, that is a very wonderful thing. Finally – and on a personal note – the 8th of September happens to be pretty meaningful in my life – being as how it’s my birthday too. I feel somewhat honoured that this adopted daughter of Swindon shares her day with such a special son of Swindon. So when I raise a glass on my birthday this year I’ll also raise a glass to Harold. And to the other 2,999 that were The Few. Bless ’em all. Gosh. I can’t believe it’s been so long. But you all know how it is listeners. Life, business, etc – it all gets in the way sometimes. Gah! Anyway here we are the Richard Jefferies Old Town walk part 2. Back in March – blimey – I published part one of two planned posts about the Richard Jefferies Old Town walk. But last I’ve found an opportunity to move on to part 2 of this posting. Still – good things are worth waiting for eh? 🙂 Unfortunately it’s been so long I can’t now remember too much about the detail of it so. NO – I didn’t take notes. Sorry. So it’s now more a case of sharing the notes from the text version of the walk and lots of photographs. I will say though that, yet again, a lot of urban discovery went on. For instance, despite many occasions of trooping up and down Victoria Hill I’d managed never to spot the plaque on the wall of a house commemorating the fact that Richard Jefferies had lived there for a time. Nor was I aware of the blocks of stone bearing quotations from Jefferies’ work – as described in ‘OPTIONAL’ below. All of which left me quite excited. As did the fantastic ghost sign on the side of a building in Old Town – having never approached it from that angle I’d not seen it before. It is an interesting walk, well worth doing that helps bring to life some of the life and times of the man. Follow the link to download a plain text PDF description of the entire richard jefferies walk. 5) Turn right into Devizes Road. Richard went to two schools here: Fentimans at Springhill and the Misses Cowell at Clarendon House (corner of Phillips Lane). Continue along Devizes Road and tun left into Bath Road. Number 19 was, in 1866, the premises of the North Wilts Herald. Under its editor, Mr Piper, Richard began, at age 17, his career as a journalist. 6) Cross Bath Road and enter Prospect Place. Only a few houses remain dating from the 1850s. In Prospect Villas (now a car park) the Misses Cowell had a school which Richard attended in 1861. 7) Enter Union Street and cut through to Victoria Road. There is now a plaque on number 93. Here Richard went to live with his bride, Jessie Baden, in 1875, and here their first child, Harold, was born. They left for London in 1877. At what is now the offices of The Star were the offices of The Swindon Advertiser owned by William Morris (not Morris of Kelmscott). He was a friend to Richard and published some of his works. Cut through Union Row to Christ Church (1831) having crossed Cricklade Street. Richard’s grandfather, John, is buried here. Walk into the churchyard; having reached the far end of the church, look right. There is a row of Jefferies graves with round-topped headstones. NB: It has to be said that we weren’t able to find a row of Jefferies’ graves though we found one or two. Also of interest in that graveyard is the memorial of the Morris** family – founders of the Swindon Advertiser newspaper. OPTIONAL. A few yards below Christ Church is Chandler Close and Holy Rood School. In the grounds are three blocks of stone engraved (1989) with quotations from Jefferies by sculptor Caroline Webb. There are also some seats. Return along Cricklade Street to The Square but do not leave without a brief visit to Wood Street: Richard knew it well. Here, in rooms over ‘Lay’s Tearooms’ * (now the Cross Keys), he and Jessie stayed for a short while before moving into 22 Victoria Street (now 93 Victoria Road). In Wood Street were shop properties owned by John Jefferies and bequeathed to Richard’s aunts Fanny and Martha. Martha Hall’s school was next to the King’s Arms. *Lay’s tearooms, then the Cross Keys is now Baker Street – the pub on Wood Street. ‘The Swindon Advertiser was founded in 1854 by William Morris (Grandfather of Desmond Morris). Originally intended to be a weekly paper, His aim was to produce a newspaper “that would act as a mouthpiece for the poor.” Morris decided to print one issue a month due to the Stamp Tax laws at the time only applying to newspapers published every 28 days. It was originally printed as a broadsheet on 6 February 1854 and titled the “Swindon Advertiser and Monthly Record” using a hand press in his father’s shop in Wood Street. Morris was sole writer, editor, printer and also delivered it personally, selling each copy for a penny. Using the inclusion of advertisements from local businesses, the second edition doubled in size. Other newspaper companies were influenced by Morris’ example of a penny priced paper and quickly produced their own in the region and ultimately throughout the country, resulting in the Government amending the Stamp Tax laws to a more favourable version. The paper became published weekly due to this change. In 1855 Morris could afford to move the publication to new premises in Victoria Road where it has remained. Morris funded the building of Newspaper House and added a printing shop to the rear. Oh listeners, I do love a bit of urban discovery as evidenced with my travelogue on the West Swindon sculpture trail and the subject of this post turned out to offer some nuggets of urban discovery. When I say ‘discovery’ I do of course mean new to or previously unnoticed by me – not that they’ve been seen by no-one before ever. I’m referring to the Richard Jefferies Old Town walk which is a trip round the eponymous area of Swindon taking in buildings and spots that were known to him. I did this walk last week with @swindondriver AKA Jess Robinson who took the photographs. I’m going to break the walk up into two separate posts as there’s a lot of it and it would be a VERY long post otherwise. Go here for Richard Jefferies Old Town Walk Part Two. 1) The bakehouse and shop belonging to Richard Jefferies’ grandfather, John Jefferies (1784-1868), stood to the right of the Corn Exchange building, fronting the road. The shop has long since been demolished. Richard went there frequently, as a child, and would have found there, also, his aunts Eliza (Sewell), Mary and Sarah. Now Jess and I weren’t entirely sure where the bakehouse and shop mentioned would have been as the description isn’t particularly clear from which angle of the Corn Exchange (the Locarno) it referred to. 2) Take the lane leading out of The Square along The Weavers and continue left into Old Mill Lane. On your right is an old ‘squeeze-belly’ stile. The path beyond it leads to Coate and would have been used by Richard to come and go, on foot. Continue along Old Mill Lane and note the buttresses in the churchyard wall. Close to this spot stood the mill, once in the charge of Richard’s great uncle James. The Goddard family mansion, ‘The Lawn’, now demolished, stood a few yards farther on. NB: the squeeze belly stile is still there – that was a new ‘discovery’ for me. 3) On the right stands what is left of Holy Rood Church. The gates are locked but if the key is obtained you may see the box tomb of Richard’s great grandfather Richard (1738-1825). Richard was baptised here. Not that I have any idea from whom or where the key is obtained – one assumes it still can be. 4) Return via The Planks (an ancient and raised walkway) to The Square and go into High Street. Notice the Bell Inn, (no longer an inn but the building and bell are still there) occasionally visited by Richard where, as a young reporter, he would talk with Sir Daniel Gooch* and other leading citizens. Cross High Street and walk to Newport Street. The National School, now pulled down, stood in Newport Street; it was run by a Mr Jenkins, and Richard attended in the evenings in his teens. Sir Daniel Gooch now has a Wetherspoons in his name – there’s lots of interesting information and pictures on the stairwell in there. For more information on Swindon’s Old Town visit: Swindon Web history of Old Town.